Each Aerocool product must meet the industry’s toughest standards while undergoing extensive airflow and heat transfer analysis, material conductivity testing and rigorous quality control examinations. When it comes to creating cooling products that are sophisticated enough to meet the today’s demands and tomorrow’s challenges, Aerocool is second to none. 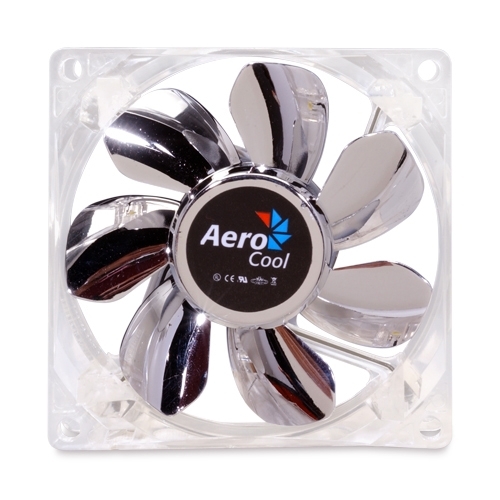 The Aerocool Silver Lightning 80mm White LED Fan features a clear body with reflective chromed fan blades illuminated by four super bright, white LEDs. The Aerocool Silver Lightning 80mm White LED Fan also has an excellent noise to air flow ratio, keeping your case quiet while keeping it cool.